BERLIN, Oct. 10 (Xinhua) -- Porsche recently announced that it will no longer offer diesel engines for its cars in the future, becoming the first German carmaker to give up the compression-ignition engines amid the ongoing dieselgate in Germany. German Transport Minister Andreas Scheuer has warned that there would be no future for diesel vehicles unless automakers "showcased their willingness" to ensure its sustained viability as a clean and efficient propulsion technology. The European Parliament has set new, ambitious targets of less emissions. German automakers including BMW have already done much in the research and development of new energy vehicles. Joining hands with Chinese companies like BYD, Star Charge and Camel Group Ltd, a wave of new energy vehicles in Europe is under way. "For us as a sports car manufacturer, where diesel has traditionally played a subordinate role, we have come to the conclusion that we want to get along without diesel in the future," Oliver Blume, chairman of the executive board of Porsche AG, told the press. The Stuttgart-based company announced the decision following similar decisions by Volvo and Toyota. It said it would concentrate instead on hybrid technology and electric mobility. "Porsche has never developed or produced diesel engines itself," Blume said. "Nevertheless, Porsche's image has suffered. The diesel crisis has brought us a lot of trouble." Following revelations that carmakers installed illicit defeat devices to understate NOx emissions from diesel exhaust systems, a landmark ruling by the Federal Administrative Court in Leipzig has enabled German cities to unilaterally ban polluting vehicles from their streets to ensure compliance with European Union (EU) clean air regulations. In Germany, Hamburg has already imposed a partial ban, with Stuttgart and Frankfurt scheduled to follow suit in 2019. Official data showed diesel cars are responsible for more than 50 percent of NOx emissions in Germany, which are harmful to human health. NOx levels exceed limits set in EU clean air legislation in several major German cities, prompting the European Commission to file the ongoing lawsuit against the German government at the European Court of Justice. In early October, MEPs proposed in a draft law a higher target of reducing carbon dioxide (CO2) emissions for Europe's new cars, by 40 percent by 2030 and an intermediate of 20 percent by 2025. Manufacturers failing to do so will pay a fine to the EU budget, which is to be used for upskilling workers affected by changes in the automotive sector, according to a European Parliament statement. Carmakers will also have to ensure that zero- and low-emission vehicles, like electric cars or vehicles which emit less than 50g of CO2 per km, have a 35 percent market share of sales of new cars and vans by 2030, and 20 percent by 2025. "Europe should assume a pioneering role in e-mobility to prevent it from being left behind in the production of new technologies by competitors in the United States and China," BMW chief executive officer Harald Krueger said. The Munich-based company hopes to lead by example in structural reforms of the German automotive industry. BMW was already the leading producer of electric vehicles in Europe and planned to sell 140,000 battery-powered and hybrid models in the course of 2018, Krueger said during its annual general meeting. In addition, BMW will develop pure electric products into its core brands in 2019. All-electric MINI will be launched in 2019, and BMW iX3 will be built in China in 2020, and then export to other countries. Krueger said the iNext, the next innovation pioneer of BMW, combines "all key technologies of future mobility" as a fully electric and partially self-driving car with high safety standards, and is planned to be on sale in 2021. 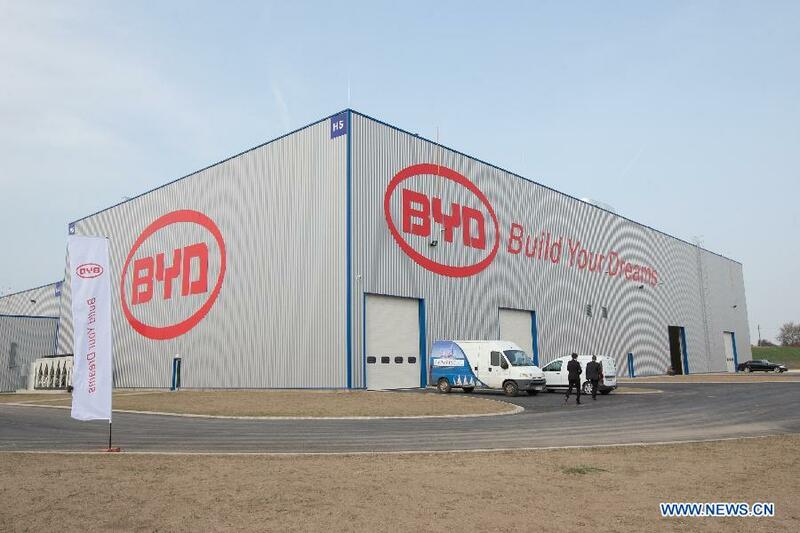 Across Europe, Chinese company BYD is the number one supplier of pure electric buses, with a market share of over 20 percent, said Isbrand Ho, managing director of BYD Europe B.V., adding that "the core expertise in battery technology is the basis of our success." In Europe, BYD's current focus is on city buses, a prime source of pollution on city streets, as well as on forklift trucks. Other products like commercial vehicles and passenger cars will follow soon in the future, Ho said. "All this is happening before the full benefits of China's Belt and Road strategy are felt and results from the work of the company's more than 22,000 R&D engineers are commercialized," he said. Through cooperation between European and Chinese companies, the vision to move into a new energy vehicle era would be realized. Another example is the recent collaboration between German charging networks Hubject and Star Charge China. Both are looking to drive the global development of open, customer-oriented charging networks for electric vehicles. The charging infrastructure expert Star Charge will bring its network of 20,000 charging points to Hubject's cross-provider charging network. The collaboration will accelerate further market development in relation to e-mobility and support the emergence of standardized market models worldwide, the two companies announced. "We are pleased about the collaboration with Hubject, as we can now offer convenient access to our network to even greater numbers of people, both in China and in Europe," said Shao Danwei, CEO of Star Charge. "In Star Charge, we have found the perfect partner in China who will help us to push on with our vision of customer-oriented charging in this very important market," said Christian Hahn, CEO of Hubject. In Croatia last year, local company Rimac Automobili sealed a 30-million-euro (34 million U.S. dollars) deal with China-based Camel Group Ltd, the single largest foreign direct investment in a Croatian technology company. This investment will help the Croatian firm further accelerate growth, introduce new products to the market and expand its global presence, said Mate Rimac, founder and CEO of Rimac Automobili. "Our strategy is to move aggressively into the new energy vehicle business -- providing advanced battery systems, powertrains and other vehicle components to major commercial and passenger vehicle manufacturers in China," said Liu Changlai, CEO of Camel Group, the largest battery manufacturer in China.